Peter Murchie and Calum Forrester have confirmed this morning that All Blacks duo Waisake Naholo and Seta Tamanivalu will be training with the club next season. Former Taranaki-teammates of Ayr Stalwart Frazier Climo, the pair finish up their Northern Tour on November 24 and will train with Ayr briefly to maintain fitness before the start of the Super Rugby season in February. It is clear that friend Climo, along with assistant coach and Kiwi Glen Tippet, were paramount in arranging the partnership. Glen Tippet expressed his delight of the deal with: "It is a win-win. For us, our players get to learn from some of the best talents in the world and the All Blacks boys develop by learning a different brand of rugby here in Scotland. The Frazier Climo link has been crucial in setting this up and when he returned to Taranaki continued to promote the Scottish game". Club president Billy McHarg stated: "Ever since Climo came to Ayr Taranaki has been a club we have had interest in. 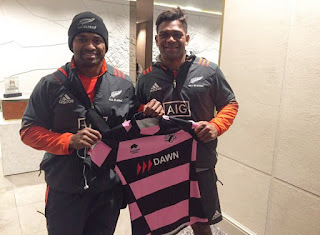 The fact Naholo and Tamanivalu are coming really says a lot about the Scottish game and we feel this will benefit the country and not just Ayr". Although only training, NZRU have looked into the possibility of Naholo and Tamanivalu receiving game time, as they look to get 'match fit' ahead of the Super Rugby season. The pair will fly into Glasgow Airport in November before travelling south for their brief spell in Ayrshire.